Verify consistency of structure/layout and formulas. At the same time, detect errors. Then easily create documentation needed to brief users. And know your spreadsheet is auditable. The bigger a spreadsheet gets, the more difficult it is to manage. With a graphical map of worksheet structures you can identify features and locate formula errors. Replace overly complex formulas with simpler alternatives. Understand and analyze conditional formulas. Keep control of formula risk and complexity. 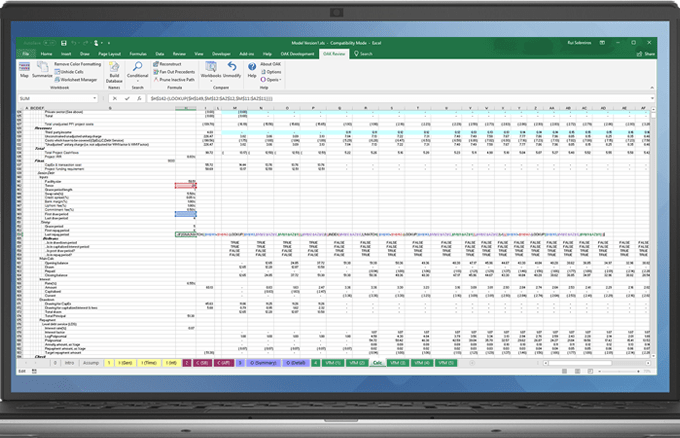 Get a clear view of your spreadsheet so that you can target and track specific worksheet properties. Manage range names, in particular those that are hidden or overlap. Quickly identify formulas that do not comply with recommended modelling practices. Compare precedents between two formulas. Then identify the differences. Make a copy of formulas, and preserve the original cell references.